It has come to my attention that June 24-30 was National Pollinator Week!! Hurray for all of the creatures who do what they can to share the sweetness of the world and help things to grow. Check out www.pollinator.org/pollinator_week.htm for lots of information for gardeners and others regarding pollination. 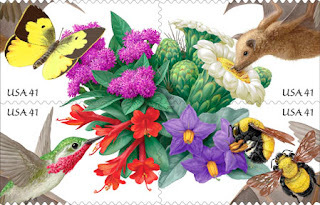 Also, look for the new stamp that will be coming out honoring all of these creatures that we love and need. Hi folks, I know the google group thingy just sent you an email saying that you will receive an email everyday. I am assuming they mean that this will only happen if I add something to the Blog, which I don't plan on doing EVERY DAY so relax. I don't intend to bombard you and risk losing my bee fans. The first photo here shows you what a wasp nest looks like, (courtesy of my parents). Wasps are mean and hairless (that's not what makes them mean though) and should be avoided. The second image shows you what a bunch of bees look like when the hang onto each other in an attempt to reach their bee tea. The third image shows you what a busy entrance board looks like. Sammy is the little one. He is learning a lot from this and asks questions like "Do insects have eyes?" ("Yes.") "Then what are their antennae for?" Matt is the big one. He thinks that I have become totally obsessed (He is probably right) but has been a supportive and involved party in all of this. I am the one working the hive. People ask what got me into this. A good question and one with several answers. Curiosity. Feeling ready to delve into a new world. Turning 40, possible mid life crisis, (this was less trouble than having an affair and cheaper than buying a sports car). And underlying it all may be my name, Deborah, which means honeybee in Hebrew. Throughout my life it has felt like an ill fitting shirt. A bit too formal and stuffy as Deborah, too young and girlish as Debbie, too abrupt as Deb. Somehow, with this endeavor, I find myself feeling more comfortable with Deborah. Like it makes sense on a below the skin level. Instead of rewriting all of what I wrote pre-Blog, I will include a few photos of what has been going on. O.K. So I am diving into the world of BLOG. 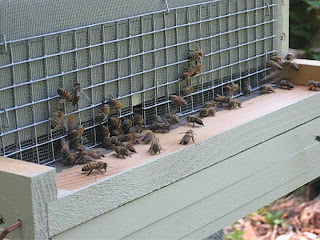 For those of you new to me, I have one beehive that I am taking care of and reporting on. So far it has been a great experience and has made for some interesting photos and thoughts. A photo of the girls sipping bee tea.